This elegant quilt is perfect to display old black and white, wedding and/or anniversary photos! Fast and simple, paper-piece it quickly and off you go! 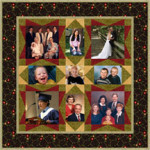 Finished size: 20 x 24"
Photo memory quilts need not be boring! It's all in the fabrics and layout you choose... and this ..
Want to make a photo memory quilt but are bored with that old side-by-side block layout? Add pizza.. 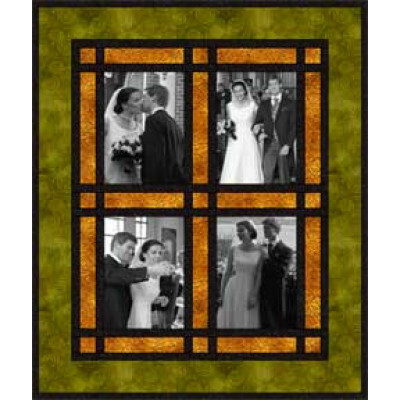 Combine this very easy and lovely appliqué design with simple piecing to make this heartwarming quil.. 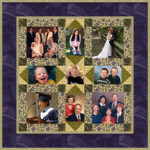 This quilt is perfect to display family photos. Make it as small or as big as you like, to accommoda.. 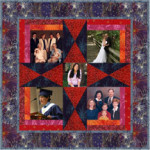 Prove photo memory quilts need not be boring! Chose “sparkly” fabrics to showcase your “stars” in th..